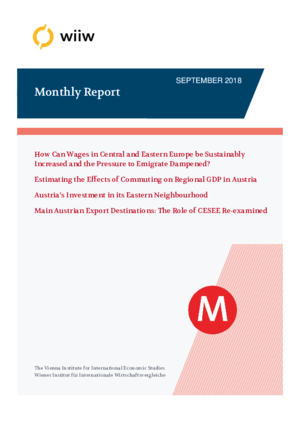 Opinion corner: How can wages in Central and Eastern Europe be sustainably increased and the pressure to emigrate dampened? The article asks whether regional GDP is a good measure of the level of economic and social development of a region. It adjusts traditional GDP by commuting, estimating the in- and outflow of wages in the Austrian regions. It finds that commuting-adjusted GDP in Vienna is lower, while in Lower Austria and especially Burgenland it is much higher than official GDP. This should lead to a rethinking of the regions’ social position, potentially including a redistribution of EU Structural Funds. Being a small economy in the heart of Europe, Austria’s significance as a foreign investor in Central, East and Southeast Europe (CESEE) is often overlooked. For all fifteen countries under consideration, Austria ranks among the top 10 investors, dwarfing global players such as the United States or China. Likewise, investments in immediate neighbouring countries feature prominently in Austria’s outward FDI stocks and appear overproportionately profitable. For Austria, the CESEE region is an important export destination, expanding over time and accounting for 21% of Austria’s exports in 2015. Nevertheless, while losing market shares, Germany remains the largest Austrian partner, with 30% of Austrian exports heading there.